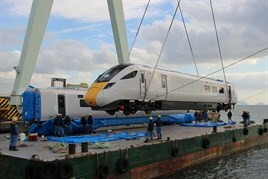 Shipment of the first completed pre-series Class 800 began on January 7, Hitachi has confirmed to RAIL. It marks the first stage in the journey of the initial 12 trains from Japan, ahead of the main assembly programme at the Newton Aycliffe plant in County Durham. The first train built as part of the £6 billion Intercity Express Programme order has now left Hitachi’s Kasado Works by ship. It will arrive at Kobe Port on January 22 before continuing its voyage to the UK. It is due to arrive in the port of Southampton in March, with the exact timing dependent on weather conditions. The nine-car train will then be taken straight to the Old Dalby test track, hauled by a GB Railfreight locomotive. The train will then be equipped with various measurement devices for testing. It is scheduled to begin running tests, as well as serving for the training of onboard staff, from April onwards. The running tests on the UK network are to be carried out by Hitachi Rail Europe, to enable acceptance by Agility Trains, the special-purpose company that will own the trains. Agility will provide the trains for the operating companies First Great Western and Inter City Railways (the latter will take over operation of the East Coast franchise from March 1). For more on this story, see RAIL 766, published on January 21.